Amsterdam, July 2nd 2017 - Speedvagen is coming to Europe for their first ever European Fitting Tour from the 26th of August to the 11th of September. For the past few years the Portland based company has previously hosted their Fitting Tours all over the world. They travel to find their people, ride their roads, share their bikes with those who have mostly seen them through the web and most importantly, these future Speedvagen owners get a full consultation and custom fitting session with founder Sacha White. With so much attention going into the bikes and the customer experience, they came to realize that no matter how good they do everything else, without a great fit, the bike will only ever be “OK”. How to bring their own fit methods to their customers around the world? They looked at how craftspeople throughout time have solved this problem, made some modifications to the traditional notion of a trunk show and launched the Fitting Tour. No matter how good the bike is made, how nice the components are or how beautiful the paint is, if the bike doesn't fit right it will never ride right. In addition to fittings for custom Speedvagen race machines, they will be hosting other events like group rides, open houses and Fit Clinics. Because their fitting methods stem from the experience of feeling what’s going on with your own bodies on your own bike, they created the Speedvagen Fit Clinic to arm riders with some tools to help them understand their own fit. If you're interested in a fitting, email info@speedvagen.com to sign up. In the middle of the beautiful canals the Speedvagen team will be doing their fittings at the Rapha Clubhouse. There will be rides with the Speedvagen crew, with the possibility for cyclists to test-ride an actual Speedvagen bike, attend a Fit Clinic as well as still signing up for a fitting* (if slots remain available). For the ultimate experience, there will be an extended stop at Christian Meier's Service Course in Girona. People from all over Europe are able to fly over and enjoy the luxury treatment that Service Course has to offer, as well as test riding bikes in the most beautiful surroundings possible. Talking about the ultimate custom-bike experience. Sacha White started making frames in 1999 under the Vanilla name. By 2003, the bikes had gained a sort of cult following and White came up against two problems: 1) the waitlist for a Vanilla had grown to 5 years and 2) because of the long wait, many owners weren’t riding their bikes the way they were meant to be ridden. Being a racer and ex-messenger himself White, while he loved to build something that was very fine, had no interest in building a bike that was going to hang on a wall. Born in 2006, Speedvagen was created as an answer to the stigma of long waitlist and perceived preciousness of Vanilla. 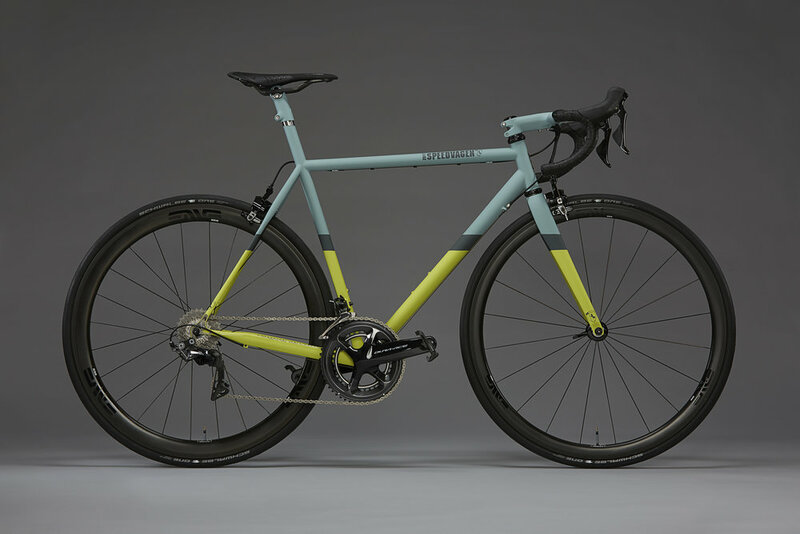 At it’s core, Speedvagen is a minimalist, modern race machine, built for each individual owner with a turn around time of 2 weeks to 2 months, depending on the details. All design, fabrication, paint and buildout is done in-house in our Portland, Oregon workshop.